Posted: Friday, April 1, 2011 1:53 am | Updated: 2:10 am, Fri Apr 1, 2011. 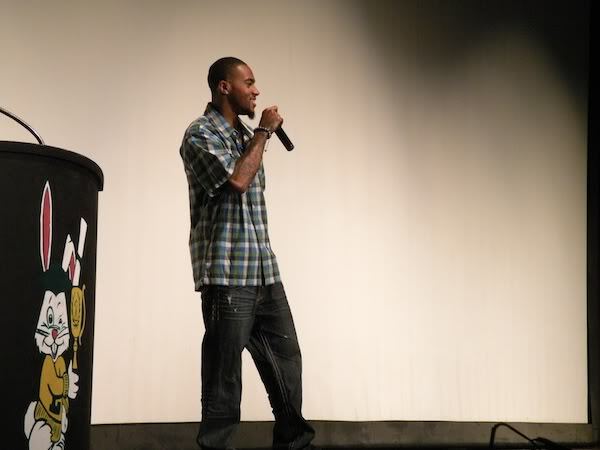 DeSean Jackson, Pro Bowl wide receiver with the Eagles and a Poly Jackrabbit, was back at his old stomping grounds on Thursday to offer words of encouragement to an auditorium full of Poly students. Backstage before the event, Jackson joked around with coaches Raul Lara and Sharrief Metoyer, reliving some of his high school memories (and challenging Metoyer and Poly point guard Alexis Moore to an impromptu basketball game which, sadly, there wasn’t time for). 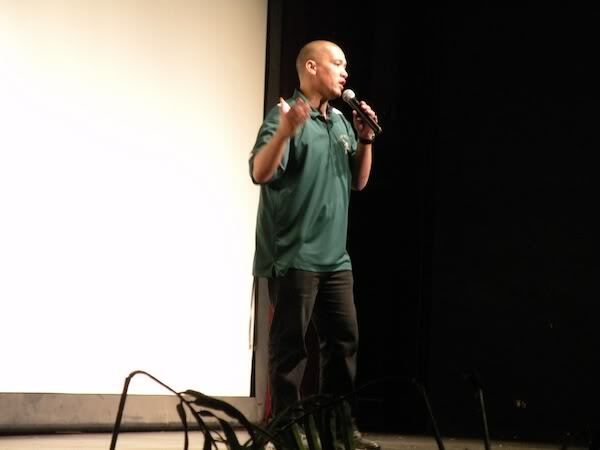 Then he took the stage to talk about overcoming adversity, ignoring bullies, and what it means to come from Long Beach. Among other subjects, Jackson touched on losing his father, Bill Jackson, to pancreatic cancer in May of 2009. “That was tough,” he said. “He’d pushed me since I was young—having a father around to care for me, a lot of people can’t say that, that’s sad to me.” Jackson and his mother, Gayle, have created a non-profit foundation to help raise funds to find a cure for pancreatic cancer, one of the deadliest forms of the disease. 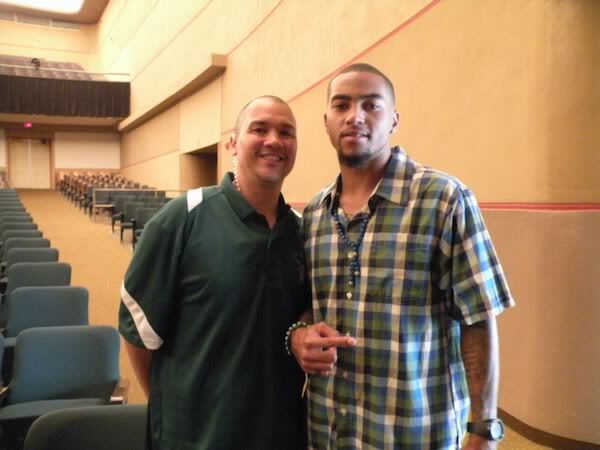 You can learn more about that or donate by visiting http://deseanjacksonsfoundation.org. Ostensibly, the biggest reason Jackson was there was to talk about his recent interest in bullying bullies. 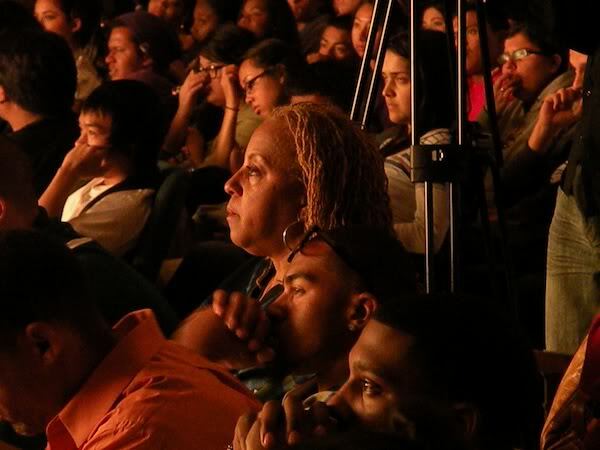 A few months ago, he appeared on the View to offer encouragement to Nadin Khoury, a young Philadelphia boy who had been beaten by seven older teenagers. It was an amazing moment. There’s no doubt which route Jackson chose when he was younger—and it’s good to see him run a curl route back to Poly to impart some positive words on the next generation.